The newly published «From the field: Travels of Uzbek Cotton Through the Value Chain» paper authored by Valentina Gurney, cotton program manager at the Responsible Sourcing Network, and Patricia Jurewicz, the RSN director and Alina Shlyapochnik, as contributing editors, presents a first part of a set of learning tools the RSN is developing for brands that want to know more about the production and characteristics of Uzbek cotton. 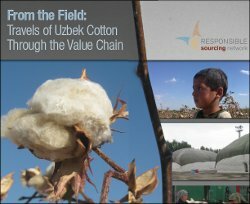 “From the field” discusses all of the channels cotton typically travels through before it is exported from Uzbekistan, brand’s risk of exposure to forced child labor associated with Uzbek cotton and actions needed to start driving forced child labor out of the fields. The second part of this series, “To the Spinner”, scheduled to be released by RSN later in 2012, will take an in-depth look at the industries of cotton trading and spinning. . Responsible Sourcing Network (RSN) (www.sourcingnetwork.org) is a project of the nonprofit organization As You Sow (www.asyousow.org). RSN addresses human rights violations and environmental destruction in the supply chains of consumer products at the raw commodity level. RSN supports network participants in leveraging their influence to achieve significant and measurable solutions in the areas of conflict minerals and child slave labor.